Certainly one of the more unusual pieces I've created. I was an Irish dancer when I was younger, and, although I can no longer participate in this incredible art form, I remain quite passionate about it. There is an incredible athletic strength required; the stamina of the dancer must be tip-top. Once skilled enough, many dancers compete against one another to become prize-winning champions. This dancer harkens a bit back to the time of her ancestors. The skull mask she wears touches on the Celt's tradition of taking the heads of their enemies as trophies and keeping them for generations. 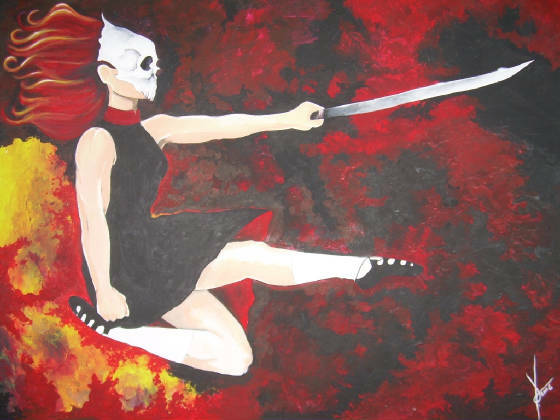 The sword she wields represents her fierce, competitive nature. She is all strength and grace. I have long intended to make a series of these. One of these days, perhaps I will.